Stellar magazine, a print magazine produced by Sequel for Astellas Pharma EMEA, has been shortlisted in the European Excellence Awards 2014. The European Excellence Awards ‘honour the most outstanding achievements of communications professionals in their field’. With stiff competition – over 1600 entries were made to the awards in total – being shortlisted is an exciting and impressive achievement. 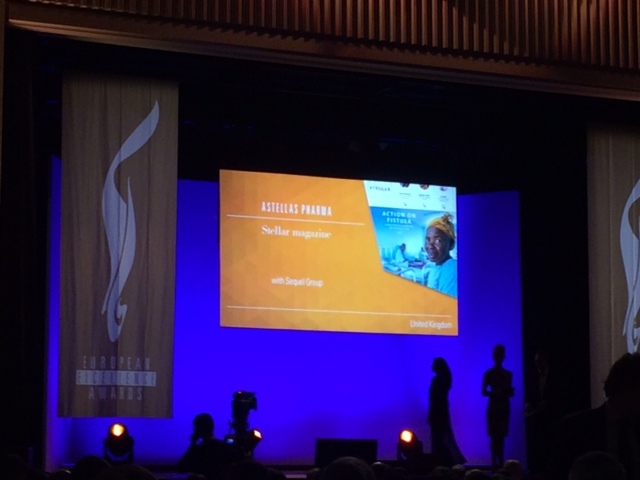 The award ceremony was held last Thursday in Paris. Stellar magazine is the flagship printed publication for Astellas that reaches more than 4,500 European staff, working alongside an integrated news site. The magazine fosters a sense of ‘one Astellas’ through employee led content and impressive designs. The success of the magazine is clear with 90 per cent of respondents to the Astellas annual employee survey saying they read the magazine. A typical comment from an Astellas’ employee about Stellar is that ‘it encourages participation, is more dynamic and allows us to better understand the company and our value as a team’. We are proud to see the work of Sequel Group and Astellas recognised and look forward to developing Stellar magazine further in the future. The full list of winners and shortlisted work is here: http://www.excellence-awards.eu/shortlist/.